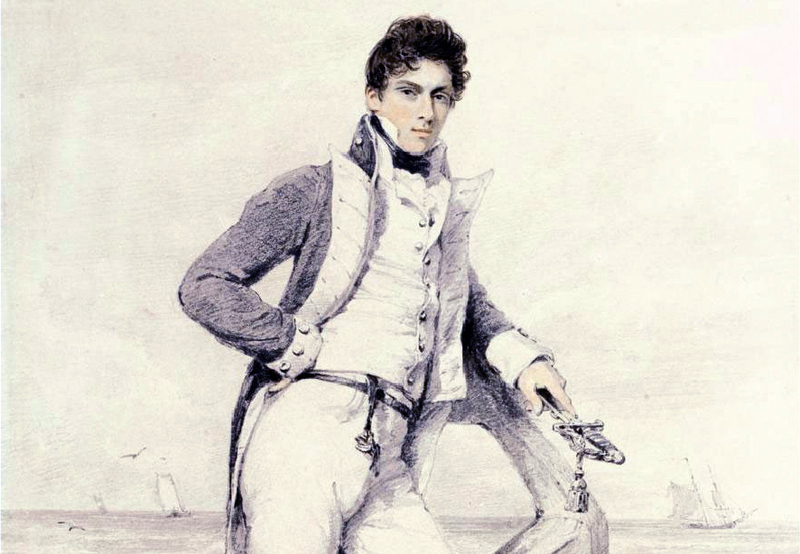 British Royal Navy commander William Hoste chased Napoleon's forces from the Adriatic. It was supposed to be a sort of second honeymoon, but this year's visit to Europe quickly seemed to turn into an extended tour of stone fortresses. Together, my wife Bonnie and I repeatedly ascended to lofty towers and battlements above ancient towns. In other words, mostly, we climbed steps. While cannons were important, it's clear that holding the high ground was the key element of warfare when these forts were new. The walled cities of Dubrovnik, in Croatia, and Kotor, in Montenegro, fired our imaginations as much as they taxed our legs. Oddly, these two cities introduced me to one amazing man: Capt. Sir Willam Hoste, Royal Navy. This was the guy who captured both cities in January, 1814, within days of one another. He took both cities the same way: by seizing the high ground. This is the stuff of fiction, and, indeed, novelist Patrick O'Brian, author of "Master and Commander," borrowed Hoste's accomplishment for his fictional Captain Jack Aubrey in another in his series of naval adventure novels. The real Hoste was only 33 when he took the cities, but was already one of the great frigate captains of the age, a friend of Lord Nelson, and the victor of one sensational naval battle after another. With a fleet of only four frigates, Hoste had taken control of the Adriatic Sea from the French. Now British ships could transport forces from city to city, evicting Napoleon's soldiers. Hoste would have the fighting support of Croats, Montenegrins and Serbs as well as the British Royal Army and Marines and his Sicilian and Austrian allies. But it was his technique of using block and tackle to pull big guns to mountain tops above the stone fortresses that would ultimately take Kotor (then called Cattaro) and force the surrender of Dubrovnik (then called Ragusa). Dubrovnik's walls are immense but the city is vulnerable from above. A cable car sweeps today's tourists to the heights above the city. Bonnie and I walked only part way up to the hilltop fortress in Kotor. 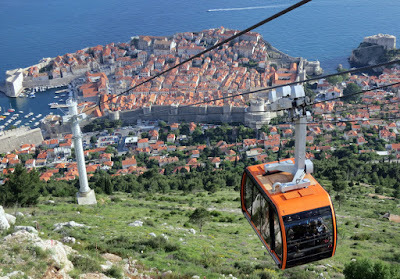 In Dubrovnik we took the pleasant cable car ride to the Imperial Fortress above the walled city. We didn't experience the day-to-day misery climbing up would have added to the burden of 19th Century soldiers. 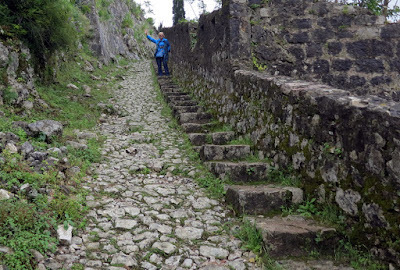 In 1814, stairs were the least of worries for the peoples of Ragusa and Kotor. Hoste's victories would give the Congress of Vienna the power to decide the fate of the two cities. They were put under Hapsburg rule, where they would stay until another war, a century later. There is no cable car for visitors to Kotor's walls. The stairs stretched on and on. We only made it half the way up. More wars followed, including a terrible one only 25 years ago. Dubrovnik, a UNESCO World Heritage site, was shelled again from on high in 1991 and 1992, killing 114 civilians. But this time the city didn't surrender. Today Dubrovnik and Kotor are tourist destinations, subject only to peaceful invasions from legions of cruise ship passengers. But the walls tell an older story. 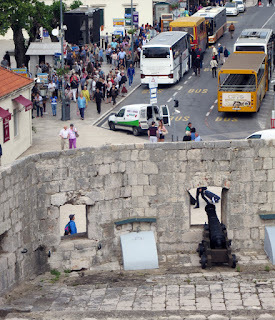 Dubrovnik's modern invaders come by bus and cruise ship.